IRS Form 2290 Penalties & Interests can be as Strong as Florence! We have well passed the Heavy Highway Vehicle Use Tax Form 2290 Due Date for Tax Year 2018 – 2019 which was on August 31st 2018. We www.Tax2290.com / www.TaxExcise.com – Products of ThinkTrade Inc., have sent enough Email alerts to all our Users so that they can E-file Their HVUT IRS Form 2290 before the Due Date, hence avoiding the troubles of Penalties & Interests for Late Filing & payment of Form 2290. Upon Observation we noted that not only our users but there are Plenty of Truckers & Trucking Companies that have not filed their Heavy Highway Vehicle Use Tax Form 2290 for the Current Tax Year 2018 – 2019 yet. If you are one among them, it is high time to E-file Federal Excise Tax Form 2290 for Tax Year 2018 – 2019. We have some information about the Impact Hurricane Florence can Create, by procrastinating your Form 2290 filing you may have to face same kind of impact from IRS that would hit you in form of Penalty and Interest. Contact our Tax Experts @ 1-866-245-3918 or write to them @ support@taxexcise.com or ping them using the LIVE CHAT option on the website to seek any Assistance related to your Form 2290 Filing. 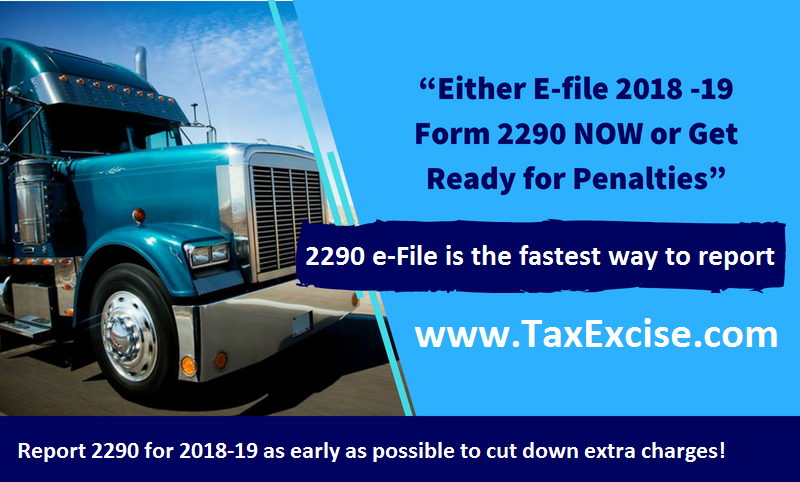 This entry was posted in 2290 for 2018, E-file 2290 Tax, Federal Excise Tax, file form 2290, Heavy Vehicle Use Tax, HVUT For 2018 - 2019, IRS Authorized E-file provider, Schedule-1 Copy, Tax 2290, Tax Form 2290, Tax Year 2018 - 2019, Truck Tax Form 2290 and tagged 2290 e-file, 2290 online, 2290 tax filing, 2290 truck tax, efile 2290, Federal Heavy Vehicle Use Tax, Form 2290, Form 2290 E-file, form 2290 electronic filing, form 2290 online, Heavy highway Vehicle use tax, Heavy Vehicle Use Tax, Highway Vehicle Use Tax, how to file irs form 2290?, IRS Form 2290, IRS form 2290 e file, IRS Tax Form 2290, tax 2290 electronic filing, Truck Tax Form 2290, what is form 2290 on September 13, 2018 by Tax Expert.